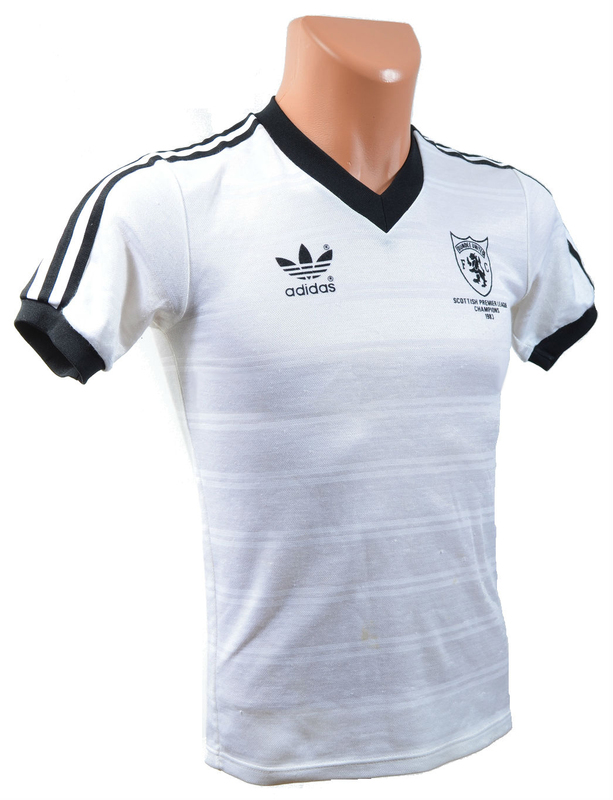 After six years of the same Adidas strip - if you include the badge modification in 1978 – United were given a new, more modern look after they had become Scottish Premier Division Champions in 1983 and were to play in the following seasons European Cup. The new V necked Away shirt was made in a less shiny material than the previous top, a mixture of polyester and cotton, and had occasional double horizontal lines running across the body, and three black Adidas stripes running from the collar down to the black cuffs on both sleeves. The shorts and socks pretty much remained the same throughout all the strips supplied by Adidas. The white shorts had three black stripes down each side, with the Adidas logo on the bottom left, and the white socks were topped with three black stripes on the turnover. The Away kit was probably first seen in the away leg of the European Cup 1st Round tie with Maltese club Hamrun Spartans in September 1983, and is also remembered for the Semi Final reverse against AS Roma in Italy. During the second season of this strips two year spell, black shorts with white trim were introduced - giving a combination that would remain throughout the rest of the 1980s. This version of the Away kit is mostly remembered for the 2-2 draw at Old Trafford against Manchester United in the UEFA Cup in November 1984.